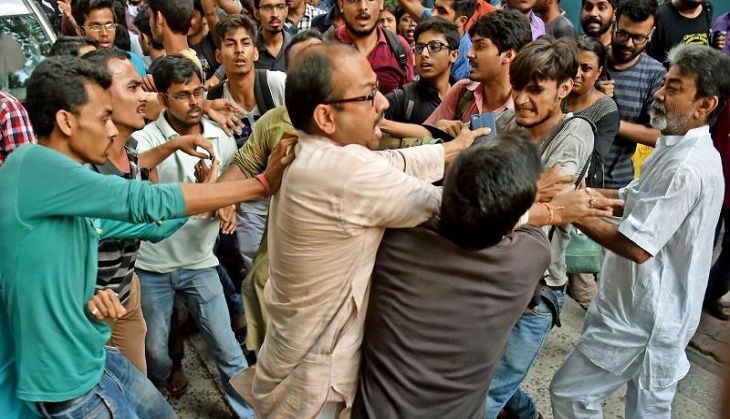 Four ABVP supporters were detained last night by Kolkata Police after clashes broke out between them and Left-wing supporters of Jadavpur University. The clashes broke out between ABVP members and activists of Left-backed student unions after the screening of Vivek Agnihotri's political film - Buddha in a Traffic Jam. The clashes left a few students with minor injuries. Black flags greeted Agnihotri at the campus gates, with slogans and placards asking him to leave. The agitating students said they have nothing against the screening of the film, but were protesting against the "divisive content" in it, which also stars Anupam Kher. Some female students were allegedly molested during the melee that ensued after the incident, police said. BJP leader Roopa Ganguly also rushed to the campus but was stopped at the gate by the police.